Be the first to share your favorite memory, photo or story of Sam . This memorial page is dedicated for family, friends and future generations to celebrate the life of their loved one. 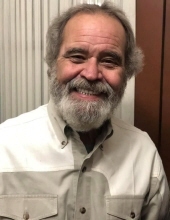 Ira Lee "Sam" Cross affectionately known as "Papa Smurf", 62 of Oklahoma City passed away unexpectedly Thursday, April 11th, 2019. He was born February 28th, 1957 in Oklahoma City to Ira Edward and Golda Mae Cross. Sam was a family man who put his wife, children, and grandchildren first in his life. Even though he is gone, the love he planted in their hearts will live on forever. Sam enjoyed riding the backroads on his Harley Fatboy making friends along the way and listening to the stories they had to tell. His favorite times were spent camping at the lake and backyard barbecues with his family. He was a dedicated, hard-working oilfield mechanic for 40+ years where he touched many lives at Parker Drilling, S&W Power Systems, Production Engines, and most recently Baseline Energy. The number of friends he made during this time remains countless. Sam is survived by his loving wife of 42 years, Ginny "Susie" Cross, his brother Darrell and wife JoAnn Cross, sister Dani and husband Rob White, and brother Kelly and wife Susan Cross. He is also survived by daughter Tammy and husband Michael Moore, son Michael and wife Valeria Cross, daughter Sarah and husband Steve Klein, daughter Stephanie Cross, son Matthew Cross, son Tony and wife Jessica Cross, 12 grandchildren, 4 great-grandchildren, and numerous others that considered him "Pops" also. He was preceded in death by his parents, Ira and Golda Cross, brother David Michael Cross, and brother Dean Steven Cross. Funeral service will be held at Barnes Friederich Funeral Home of Midwest City, Oklahoma on Tuesday, April 16th, 2019 at 10 am with burial to follow at Sunnylane Cemetery of Del City, Oklahoma. The family would like to extend a special thank you to Ralph Platz for his life-saving efforts, to Graham Radler and the Baseline Energy team for their extraordinary support during this difficult time, and to Pastor Jonathan Roberts for his faithful, devoted care to the needs of the family. To send flowers or a remembrance gift to the family of Sam "Papa Smurf" Cross, please visit our Tribute Store. "Email Address" would like to share the life celebration of Sam "Papa Smurf" Cross. Click on the "link" to go to share a favorite memory or leave a condolence message for the family.